Action from Tuesday night's Deeping v Yaxley game. Yaxley boss Brett Whaley has described a free Saturday as a ‘godsend’ ahead of a series of crucial United Counties League Premier Division games. The Cuckoos continue to battle for a top-three finish despite possessing several knocks within their small squad. Scott Carter became the latest casualty when being forced off in a 2-0 derby triumph at local rivals Deeping on Tuesday night. The Cuckoos emerged victorious thanks to a deflected Ricky Hailstone shot and a late clincher from Dan Cotton – his 20th goal of the season – after home player Dan Flack had been dismissed. Yaxley now face a run of three successive matches against top-six sides, starting with a visit from Thurnby Nirvana next Tuesday. Whaley said: “We’ve got some big games coming up against sides close to us in the table. We’ve been getting through games lately by using people who aren’t fully fit so the break this Saturday could not come at a better time. It is a godsend for us. “We feel that any outside hopes of winning the title went when we lost at Wellinborough a couple of weeks ago. “Finishing third is the goal from here although we have to accept that Wisbech are now favourites for that position. Yaxley are through to the quarter-finals of the UCL KO Cup and Hinchingbrooke Cup, and have reached the final of the Hunts Senior Cup without kicking a ball. They received a first-round bye and a semi-final walkover when St Neots Town were unable to raise a side to face them in what has become a farcical competition. 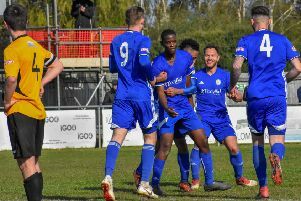 Thurlow Nunn Premier Division second-placed side Godmanchester Rovers will be their final opposition on May 1 at the Cozy Stadium in St Neots. Godmanchester also received a semi-final walkover with St Ives unable to get a team out to face them last night (Wednesday).